In his keynote address to the 2013 NADA Convention and Expo on Saturday afternoon, Hyundai President and CEO John Krafcik revealed a lot about Hyundai’s future intentions. As he addressed a packed house in Orlando, Florida, the Hyundai executive told dealers to defy conventional wisdom and touched on the ways Hyundai has taken unconventional approaches with its design, retail processes, and premium products. He gave a glimpse into future products for the South Korean automaker, and it will include more premium products. The recently unveiled HCD-14 Genesis Concept that made its global debut in Detroit is a good example of what Hyundai’s intentions are in the future. And it will include going against what most automakers are doing. After coming off a record year in 2012 with an 8.6 percent increase in global sales last year, it’s hard to argue with their business model. Global sales last month in January were up 27.8 percent over last years numbers. Hyundai is one of the fastest growing automakers in the world and currently have seven overseas plants in Brazil, China, the Czech Republic, India, Russia, Turkey and the U.S. The Korean automaker has a goal to overtake their hated Japanese rivals in the automotive industry and are making global strides in that direction. They are also looking at the German luxury automakers and see another huge area that they can compete in. And Hyundai isn’t afraid to defy convention and move in a different direction than most automakers. Look for Hyundai to defy convention by developing more premium luxury vehicles in the future. It will also include developing fuel-efficient models that will appeal to the global masses. Krafcik cited Hyundai’s all-four-cylinder engine approach with Sonata and its unconventional premium product retail strategy with Genesis and Equus as examples. Hyundai will keep the premium products under the Hyundai banner and let its sister company Kia appeal to a younger generation with products like the Soul and all-new hot Kia Forte 5-door SX performance hatch. The two Hyundai Motor Group companies are having much success and Hyundai will keep the brand moving into more luxury vehicles in the future. The current results see Hyundai having stronger buyer demographics and a nine percent market share in the premium segments in which it competes. Hyundai believes they can overcome future challenges and design cars that defy conventional wisdom and delight and satisfy their customers needs. It’s a good business model to follow and is moving the South Korean automaker forward. 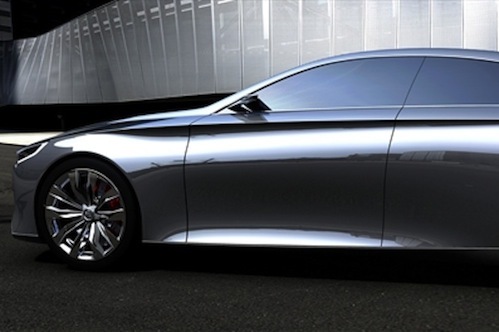 The recently unveiled HCD-14 Genesis Concept gives us an idea of where Hyundai is headed.